Ford employees are driving innovation in every part of the business at a record pace; the number of individual Ford employees inventing has reached record levels and the number of total Ford inventions is expected to set an annual record in 2016. Through August of this year, more than 4,500 Ford employees have already submitted invention disclosures, with nearly 1,700 of them first-time inventors; since the beginning of 2015, more than 3,500 first-time inventors have submitted innovations. Three recent Ford innovations include a prototype car that collects condensation from vehicle air conditioners, then filters and pumps it inside the cabin; a passenger-centric, remote-controlled SYNC® system that could give ride-sharing passengers control of the infotainment screen; and a transportable robotic device that can move people and objects short distances where cars aren’t accessible. When Doug Martin read about a billboard in Lima, Peru, that turned humidity into drinking water for the local population, an innovative idea struck: What if cars could be a source of water? Martin and Rollinger’s innovation is one of a growing number of inventions created by Ford employees in recent years. The increase in innovation – as measured by invention disclosures – is expected to reach a company record in 2016, topping last year’s record of more than 6,000. 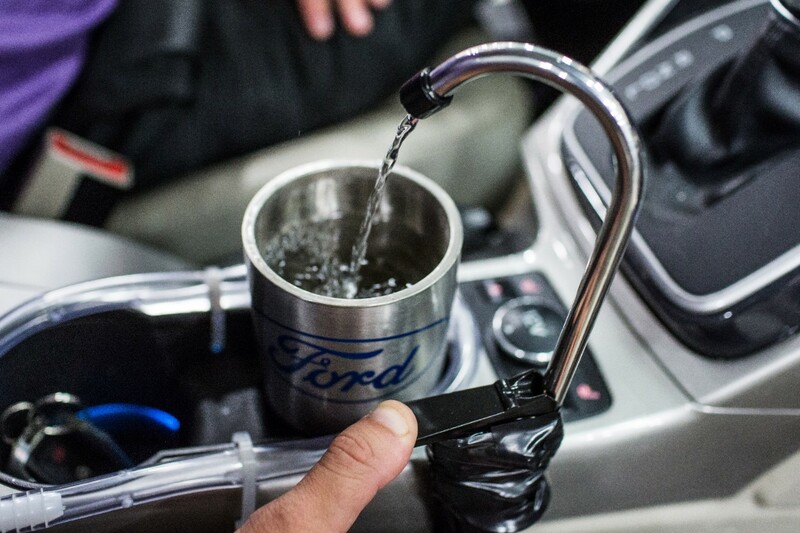 The number of inventions isn’t the only figure increasing at Ford; the number of individual Ford employees creating inventions has reached record levels since the start of 2015, with more than 3,500 first-time inventors submitting new innovations. Ford innovations highlighted today at the company’s annual Further with Ford trends conference include a passenger-centric, remote-control SYNC® system that could give ride-sharing passengers control of the infotainment screen; and a transportable device that can move people and objects short distances where cars aren’t accessible. previousnext SEP 20, 2016 | DEARBORN, MICH. FORD EMPLOYEES ON PACE TO SET RECORD FOR INVENTIONS IN 2016 Ford employees are driving innovation in every part of the business at a record pace; the number of individual Ford employees inventing has reached record levels and the number of total Ford inventions is expected to set an annual record in 2016 Through August of this year, more than 4,500 Ford employees have already submitted invention disclosures, with nearly 1,700 of them first-time inventors; since the beginning of 2015, more than 3,500 first-time inventors have submitted innovations Three recent Ford innovations include a prototype car that collects condensation from vehicle air conditioners, then filters and pumps it inside the cabin; a passenger-centric, remote-controlled SYNC® system that could give ride-sharing passengers control of the infotainment screen; and a transportable robotic device that can move people and objects short distances where cars aren’t accessible DEARBORN, Mich., Sept. 20, 2016 – When Doug Martin read about a billboard in Lima, Peru, that turned humidity into drinking water for the local population, an innovative idea struck: What if cars could be a source of water? Martin’s idea to turn cars into a source of water boils down to the reality that fresh water is a scarce resource. Innovation comes easily to Martin, a Ford powertrain controls engineer who holds roughly 70 auto-related patents. After graduating with bachelor’s and master’s degrees in electrical engineering from the University of Michigan in Ann Arbor, he came to work for Ford. He’s been with the company for a combined 22 years. How can we empower the passenger in a ride-sharing service, who typically has little control over the journey? 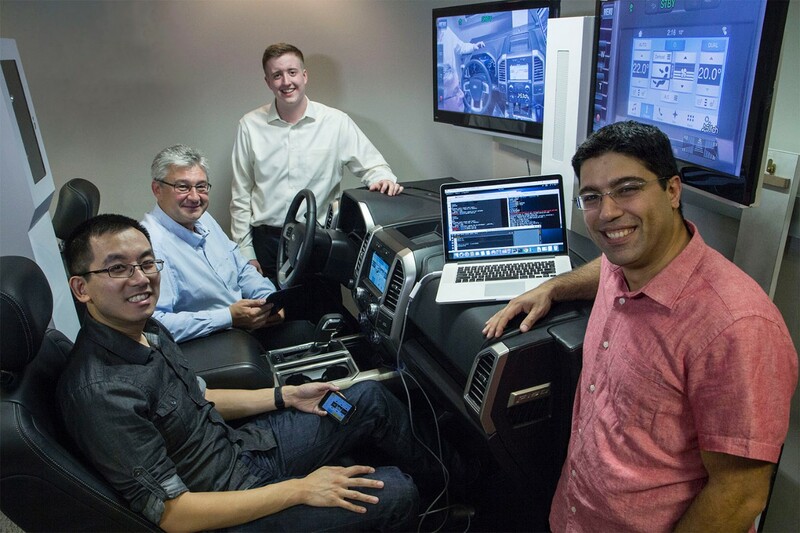 For Ford’s Oleg Gusikhin, Omar Makke and Jeff Yeung, the challenge could be easily addressed from their experience working with Ford SYNC. 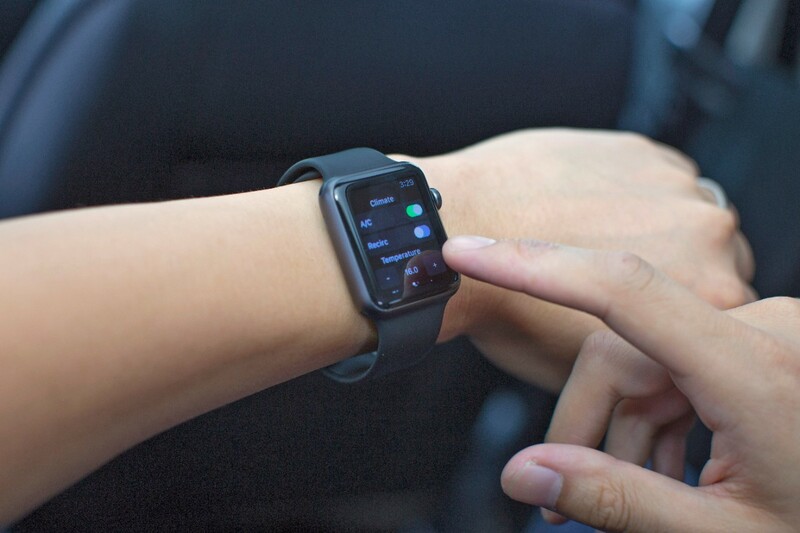 “By rethinking mobile connectivity from the passenger’s perspective, we saw how we can use smartphones to give riders control through SYNC without the need to be directly paired via Bluetooth,” said Gusikhin. Ultimately, this thinking spawned a new software invention – SYNC Remote Control. With the support of Ford’s Perry MacNeille and Jack Van Hoecke, the idea evolved in a matter of months into a remote function that allows passengers to control SYNC features like radio and climate settings. When a passenger gets into a ride-sharing car, he or she taps a mobile device that automatically opens an app interface that gives him or her control of the radio and climate. Eventually, any controllable feature, like the passenger seat and more, could be added. It works, because it uses open-source software to connect the rider’s phone to SYNC through the driver’s phone – without additional pairing. The software includes a translation feature, for when driver and rider don’t speak the same language. The rider simply types what he or she wants to say into the phone, and SYNC conveys it in the language of the driver. These features, which help make the ride more enjoyable, hold immense potential for a future of ride-sharing services – especially for fully autonomous vehicles where there is no driver. You don’t have to talk long to Gusikhin, Makke, Yeung and the support team to tell they’re as excited as anyone about a future in which the smartphone becomes the main way to not only order, but also manage, your ride. Effectively, your smartphone becomes your car, helping personalize and control your journey in a way that’s familiar to you. Kilian Vas, a Ford systems engineer in Cologne, Germany, knows that last part of any urban commute can be tricky. You’ve just stepped off the train, or drove into and parked in the city, and you still need to walk or bike to your destination. So when Ford issues an innovation challenge for a device to help people handle city life and get around town, the forward-thinking Vas couldn’t help but answer. For many, his innovation – a four-wheeled electric pedestrian assistant called Carr-E – is a welcome alternative to getting around the city. 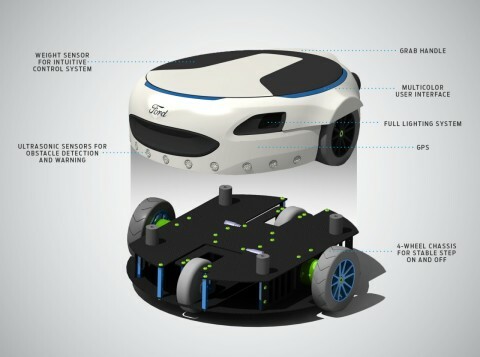 Carr-E’s multipurpose functionality separates it from other electric personal transportation devices. In addition to carrying riders, Carr-E can be used to transport heavy objects. Users simply place the object on the device and it will follow an electronic transmitter they keep in their possession. Vas was inspired to create the device’s compact, circular design when he noticed the empty space inside the spare wheel well of his car. Commuters can easily store it in a vehicle, then pull it out and use it in places where cars aren’t permitted or practical. Vas has been innovating since coming to Ford three years ago with a bachelor’s degree in automotive engineering and a master’s in mechanical engineering, both from the University of Applied Science Dortmund. His first innovation at Ford, a head restraint that folds to allow space for a child seat and has foldable wings for napping, was patented. Ultimately, Vas sees Carr-E as one of many solutions for the advanced transportation ecosystem evolving in city centers globally.